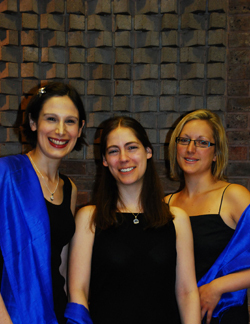 Azure is a flute, oboe and piano trio who have appeared at many high profile venues, including Tate Britain art gallery and the Guildhall in the City of London. They are experienced in providing music for weddings, dinners, corporate events and private parties. This exciting trio of experienced musicians have played in a wide variety of settings, and are equally at home on the concert platform, in corporate functions or the recording studio. Lucy has given solo recitals at venues including the Purcell Room, Huddersfield Contemporary Music Festival, Fairfield Halls, St. Martin-in-the- Fields and St. James’, Piccadilly. She graduated with First Class Honours from Trinity College of Music in 2006 and has since continued her studies privately with Sharon Williams, Nancy Ruffer, Michael Cox and the late Sebastian Bell. She is an Extra player with the BBC Scottish Symphony Orchestra. From 2007-9, Julia played with Santiago Philharmonic Orchestra, Chile on cor anglais and oboe, first as a guest soloist, and then as a permanent member of the orchestra. She studied at Trinity College of Music where she gained an Advanced Postgraduate Diploma with distinction, and was a Junior Fellow. Julia also has an MA in music from Birmingham Conservatoire. Ruth plays regularly throughout London and the South East at venues including the Barbican Centre, Kensington Palace and Riverside Studios. She has also performed as a concerto soloist at the University of Essex. Ruth studied performance and composition at Colchester Institute, achieving a first class BA Hons in 2003. She then continued her study of composition as a postgraduate at Trinity College of Music. For venues without a piano, a portable keyboard is available. Concert 4 – Music for dancing – from a classical Mozartean minuet to a twentieth century Rumba! Concerts can be given both with or without spoken introductions to the music, as required. Lecture recitals with more detailed information and analysis are also available.